RNA Interference (RNAi). Recent advances in genetic sequencing are beginning to shed light on functionally redundant genes which drive cancer development. RNA interference circumvents the druggability issue associated with many disease-driven genes by acting at the mRNA level. Thus, successful RNAi therapy has the potential to revolutionize cancer therapy by mediating the silencing of any gene deemed essential for cancer progression. However, the lack of safe and effective methods to deliver siRNA remains the primary technical hurdle for this revolutionary treatment modality. Video 1. Schematic of nanoparticle platform for siRNA and drug delivery. Unlike cationic lipid based nanoparticles that are well known for rapid liver and spleen deposition, our nanoparticles (Video 1) are optimized by the particle size (based on the survey of 130 clinically relevant nanoparticles done at the Nanotechnology Characterization Laboratory of NCI), charge (by tuning the net charge of silica, cationic polymer, and siRNA altogether), and solubility (enhanced with PEG) to avoid the recognition by the body’s immune system and subsequently prolong blood circulation time following intravenously injection (IV), leading to tumor accumulation based on the leaky vasculature and poor drainage of the tumors (Figure 1A). The HER2-antibody conjugated on the nanoparticles will target HER2 receptors on the cells and enter the cells via endocytosis. The selected cationic polymer has buffering ability and thus compromises the endosomal membrane due to influx of protons and water molecules, thereby allowing the siRNA to escape (Figure 1B) to the cytoplasm where siRNA can be processed and function to silence the target gene (Figure 1C). It’s important that the nanoparticles allow siRNA to escape the endosome in a timely manner before it is degraded in the lysosome. Figure 1. 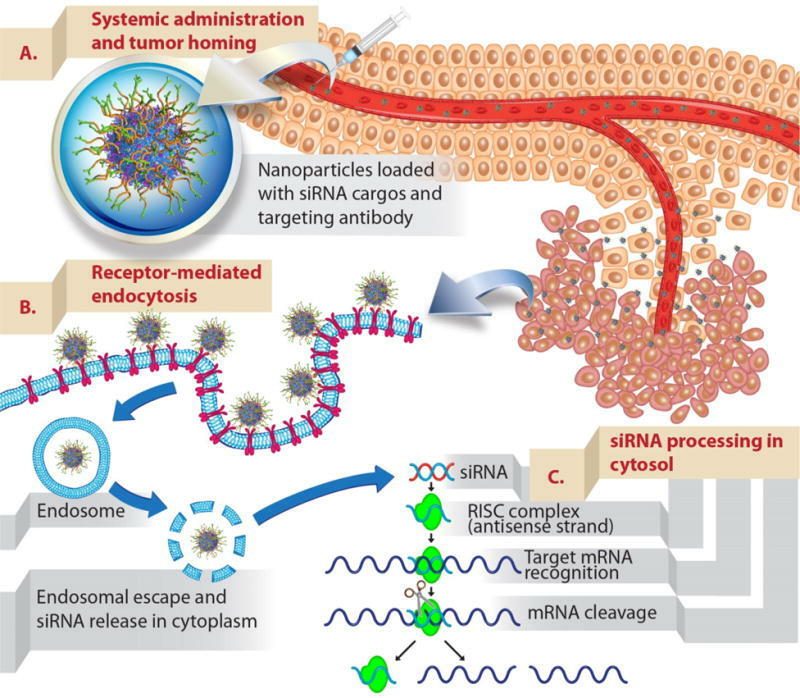 Illustration of the fate and action of siRNA-nanoparticles upon IV administration. Developed at PNNL (Yantasee’s former institute) for environmental applications, functionalized high surface area materials (especially self-assembled monolayers on mesoporous support, SAMMS), PDX Pharmaceuticals has developed SAMMS into oral chelation therapies. 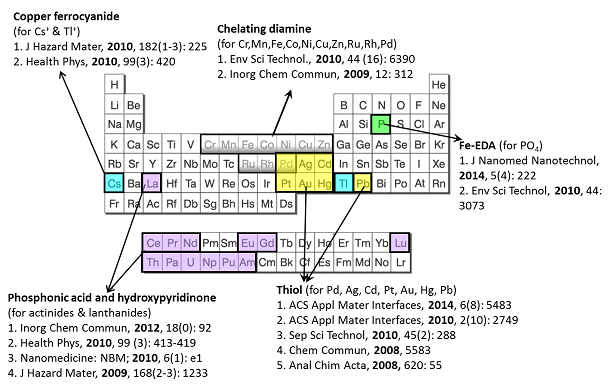 With the right ligand design and right substrate materials, we could selectively capture different classes of metal ions across the Periodic Table (Figure 2), including soft heavy metals, transition metals, lanthanides and actinides, oxometallate anions, and large monovalent cations. Our current focus is on toxic metal chelation (Hg, Cd, Pb, As) and phosphate capture in the GI tract to treat hyperphosphatemia. Figure 2. Tailoring ligands on nanoporous sorbents (SAMMS) for targeting metal ions across the Periodic Table.